Let me start by saying that this is a book to be savored. And it's already on my list of favorite books I've ever read. Not favorite of 2012... FAVORITES EVER. I'll be re-reading this book for the rest of my life. You hear that? I'll be telling you about my love for it in no uncertain terms. Now let's begin. 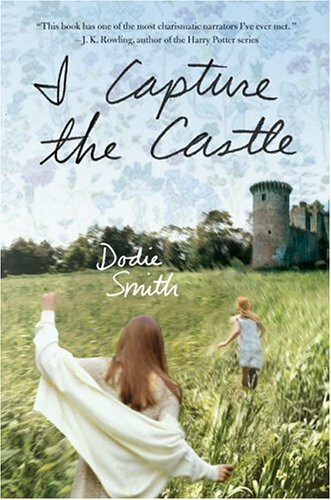 Cassandra Mortmain lives with her father, stepmother, sister and brother in a rundown castle in the English castle. While a castle may sound romantic, the family's poverty certainly isn't. Mr. Mortmain was a famous author, but a series of events have left him temperamental and unable to write anything. Topaz, her stepmother, is a free spirit. Modeling for painters, she longs to be someone's muse. Rose, Cassandra's older sister, just wants to marry a rich man. As a beauty, it's likely she'll be able to accomplish her goal. The younger brother, Thomas, exists but doesn't often step into the spotlight. The book is written as Cassandra's journal, chronicling her observations and thoughts on everything going on around her. As an aspiring writer, it's delightful to watch Cassandra mature as the book progresses. It's a coming-of-age story with a narrator who reminded me of Anne from Anne of Green Gables. And that's quite a compliment because I adore Anne. Life is rather routine for the Mortmain family until two American brothers, Simon and Neil Cotton, arrive and throw everyone into a tizzy. I knew next to nothing about this story, and I think it's best experienced that way. Let me just say, however, that I found this book to be enchanting. Cassandra's voice is winningly naive. She charms you and disarms you with her thoughtful (and often comical) reflections. I also have to love a girl who references Pride and Prejudice rather often. I had heard of this book, but I'd never felt compelled to read it until I found it in a little bookstore in San Francisco. Determined to buy a book while I was visiting the city, I took this home with me. And I'm oh so glad I did! I was shocked by how quickly I fell in love with this witty and memorable book. This is the kind of story and narrator that creeps into your heart and just leaves you feeling warm and glowy inside. I can't say enough about how much I loved the writing. I wanted to savor it, to roll each word around in my head and let the descriptions come alive off the page. But the story was good, too! I wanted to race ahead and find out what was going to happen next. In my opinion, that makes for the best kind of book. There aren't enough words to tell you how much I loved this story, this family and this world. I don't know whether to be happy I finally discovered it or to be mad I didn't find it sooner! This book won't be right for everyone, but it was the perfect read for me. I honestly think you'll probably know if you'll enjoy this book just by reading the first page. First of all, this sounds lovely and I want to read it. But I wonder if I should wait until later in the year when I get some Austen under my belt? Especially since you mention that there are lots of P&P references and there is that quote about living in an Austen novel? Also, the more you mention Anne, the more I want to do an Anne re-read this year. But seriously, this sounds wonderful. But I don't want my lack of Austen-knowledge to make me love it less than I could potentially love it. Does that make sense? You'd enjoy this one even if you didn't have any Austen experience :) I just picked on those references because I'm a huge Austen lover. You definitely don't have to read Austen to enjoy this! And I re-read the first three Anne books last year, but I'm still planning on reading the rest of the series again this year. I love me some Lucy Maud Montgomery. Even you decide to read Austen first, I really look forward to your thoughts on this one! I think it's so delightful. I've had this sitting on my shelf for years unread! Must.get.to.it. YES! Read it, Jamie. It's lovely! This sounds like one of those books that's classic for obvious reasons. The timelessness. The strength of the heroine. The awesomeness of it all. Yeah, I added it to my TBR. Thanks for the sweet review! I have been meaning to read and see this one. So glad you liked it. Yeah, I need to go watch the movie now. Hope you end up reading it - it's delightful! Although I totally spent the whole entire book wanting Cassandra to get together with Stephen. I've been jonesing for a re-read of I Capture The Castle, and also a watch-ing of the movie. Perhaps in March. Lovely, lovely, lovely review Hannah. I have a feeling this is a book I'll be re-reading over the years. It just has the feel to it like I won't ever get tired of revisiting the characters. Have you seen the movie before? I haven't but I've been meaning to watch it! Thanks for the kind words, April! I remember trying to read this years ago because of the J.K. Rowling blurb on the cover but at my fragile young age (okay, I was like, thirteen) I could not get into this book. I am so glad I picked it back up again this year and FINALLY read it for real. Haha I don't think I would have necessarily like it at 13 either. And yay for finally reading it and enjoying it! It really does make you laugh at times. And YES READ ANNE. I'm going to keep slipping hints into everything until you finally do. I read this book so long ago and remember really liking it. It's gotten a little fuzzy though, so thanks for reminding me that I'm overdue for a re-read! Yay! I love re-reading, and I'm so happy you might revisit this one. I definitely think it's the kind of book that I'll fall even more in love with when I re-read it. You make me want to go out and find a copy of this one, because it sounds absolutely wonderful. I love that it's about a girl who writes! And it sounds like the writing really drew you in. This book sounds absolutely lovely! And perfect for my TBR list, since I've been drawn towards the classics lately. Oh and if you can remember, what was the name of the bookstore where you found it in San Francisco? The hubs and I are taking a trip out there in May and I would love any suggestions on places to go! And the bookstore I found this at was The Booksmith - in the Haight & Ashbury area of San Fran. It was a pretty cool store, but my favorite bookstore I visited there was Alexander Book Company near Market & Mission. It was three stories of books - I could have spent SO much time in there! Wow, Alexander Book Company sounds like heaven! Thanks for the recommendation!